The optimist generally looks at the measurable things in life as half full. For example, if they have a half bowl of fruit, they will say the bowl is half full. On the other hand, the pessimist will say that the bowl is half empty. In the Bible we can see fullness and emptiness as well. Here is what I found in the Bible about half empty and half full. Solomon wrote much about vanity in the Book of Ecclesiastes. One definition of vanity is “the quality of being worthless or futile” . Here is what we find about vanity, or the emptiness of worldly living. Ecclesiastes 1:8 All things are full of labour; man cannot utter it: the eye is not satisfied with seeing, nor the ear filled with hearing. Ecclesiastes 2:1 I said in mine heart, Go to now, I will prove thee with mirth, therefore enjoy pleasure: and, behold, this also is vanity. Ecclesiastes 6:7 All the labour of man is for his mouth, and yet the appetite is not filled. Ecclesiastes 11:10 Therefore remove sorrow from thy heart, and put away evil from thy flesh: for childhood and youth are vanity. That worldly desire brings happiness for a short while. Before long, your heart becomes empty and you are left feeling unsatisfied. Isaiah 65:13–14 Therefore thus saith the Lord GOD, Behold, my servants shall eat, but ye shall be hungry: Behold, my servants shall drink, but ye shall be thirsty: Behold, my servants shall rejoice, but ye shall be ashamed: Behold, my servants shall sing for joy of heart, But ye shall cry for sorrow of heart, And shall howl for vexation of spirit. Matthew 12:43–45 When the unclean spirit is gone out of a man, he walketh through dry places, seeking rest, and findeth none. Then he saith, I will return into my house from whence I came out; and when he is come, he findeth it empty, swept, and garnished. Then goeth he, and taketh with himself seven other spirits more wicked than himself, and they enter in and dwell there: and the last state of that man is worse than the first. Even so shall it be also unto this wicked generation. The fullness of Jesus satisfies the deepest needs. Your cup is overflowing with this unspeakable gift. The Holy Spirit produces fruit that allows us to know the fullness of blessing, fullness of joy, fullness of God, fullness of the Spirit and even the fullness of wisdom. Ephesians 1:22–23 And hath put all things under his feet, and gave him to be the head over all things to the church, Which is his body, the fulness of him that filleth all in all. Ephesians 5:18–21 And be not drunk with wine, wherein is excess; but be filled with the Spirit; Speaking to yourselves in psalms and hymns and spiritual songs, singing and making melody in your heart to the Lord; Giving thanks always for all things unto God and the Father in the name of our Lord Jesus Christ; Submitting yourselves one to another in the fear of God. Colossians 1:19–20 For it pleased the Father that in him should all fulness dwell; And, having made peace through the blood of his cross, by him to reconcile all things unto himself; by him, I say, whether they be things in earth, or things in heaven. So how are you looking at things? Have you considered the fullness of joy that you have being a child of God? You have a place in Heaven. Your sins are forgiven, even those ones you have yet to commit! You look forward to forgetting the cares of this world and spending eternity with Jesus. That is more than half full – it is fullness beyond measure! Beautifully done my sister. So true. We have more than we know. Our cup overflows. 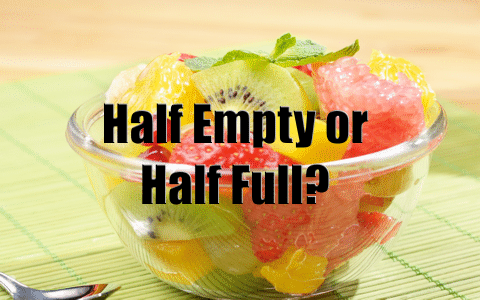 In fact, a half empty or half full cup makes me thankful I even have a cup at all! Wonderful article. How do we get our love ones to see the fulllness of the Lord though they think that they are not they really are not. Previous post: What Will We Look Like In Heaven? Next post: How Do We Become More Christ-like?